The Customize Windows > Computer and Internet > Cloud Computing > What is Community Cloud? What is Community Cloud? Community Cloud is a Cloud Computing Service Model that provides a cloud computing solution to a limited number of individuals or organizations in which infrastructure is shared between several organizations. So, we need no know what is Cloud Computing Service Model on the first place. Usually, the answer to the question, What is Community Cloud is search based, fully made and optimized for Google Web Search – you will definitely find, after searching the web with the phrase What is Community Cloud, nothing clearly written and either too brief or deliberately made tougher to understand. Community Cloud basically has the features of both the public and private cloud models. Like a public cloud, the community cloud may contain software, data storage, and computing resources that are utilized by multiple organizations. On the other hand, like a private cloud, these organizations are responsible for the operation of their own infrastructure. The community cloud model can provide greater cost savings than the private cloud while offering some of its security features. So, basically Community Cloud should not be counted as a technical classification of Cloud Computing itself. Multi-tenancy is sometimes said to be a feature of Community Cloud – but this is wrong. One must understand the level of abstraction – Cloud Computing and Relationship with Service Oriented Architecture. Community cloud involves sharing of computing infrastructure in between organizations of the same community. For example all Government organizations within the state of California may share computing infrastructure on the cloud to manage data related to citizens residing in California. In this case, as the identification and login is secured, Community cloud just become another way of saving resource – to some extent. When agencies have a common set of requirements and customers, a community cloud enables them to combine assets and share computing resources, data, and capabilities. By eliminating the duplication of similar systems, agencies can save money and more efficiently allocate their scarce resources. Procuring a community cloud is also a way that an agency can advance the Federal IT Shared Service Strategy. 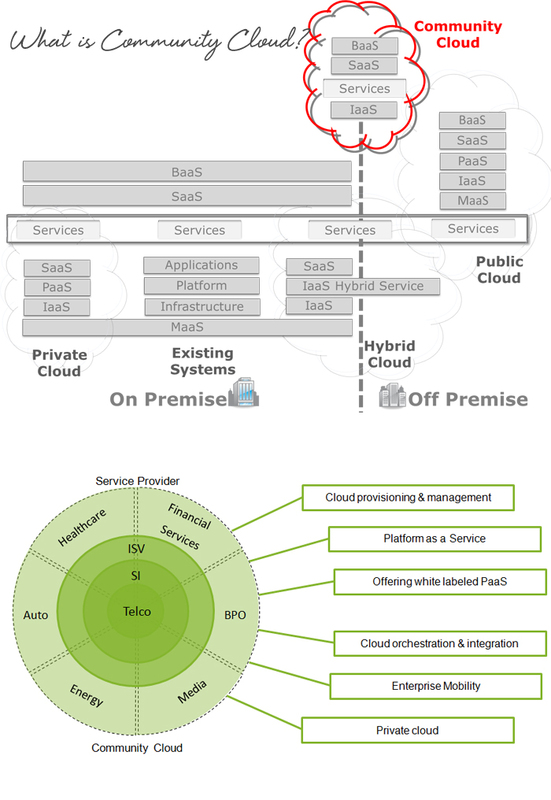 From outside, it is never possible to mark a model as Community Cloud unlike Private Cloud and Public Cloud. Obviously, the difference is at the level of Abstraction Layer – co-sharing Public Cloud items can not be an example of Community Cloud. This Article Has Been Shared 2627 Times! Articles Related to What is Community Cloud? Title: What is Community Cloud? Cite this article as: Abhishek Ghosh, "What is Community Cloud?," in The Customize Windows, January 8, 2014, April 26, 2019, https://thecustomizewindows.com/2014/01/what-is-community-cloud/.